The Bengal tiger (Panthera tigris tigris or Panthera tigris bengalensis) is sometimes known as the Royal Bengal tiger and is a subspecies of tiger. The Bengal tiger is the second largest and the most common tiger subspecies. The Bengal tiger is primarily found in Bangladesh, India and also in Nepal, Bhutan, Myanmar and in southern Tibet. 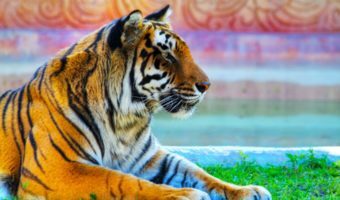 The Bengal tiger inhabits in grasslands, subtropical and tropical rainforests (mostly Asian rainforests), scrub forests, wet and dry deciduous forests and mangroves. The Bengal tiger is the national animal of India and Bangladesh. An average male Bengal tigers weigh around 420 pounds. The Bengal tiger has a body length of 6 feet and a tail length of 3 feet and therefore has a total length of 9 feet long. A female Bengal tiger is only 310 pounds and 8 feet long including tail. Bengal tigers are incredibly strong and are able to drag their prey almost half a mile even though the prey may be heavier than itself. A tigers coat can actually take on a variety of colours. The standard colours of a Bengal tiger are an orange body with black stripes coming down the sides. The two most common variations are the White Bengal tiger and the Golden Tabby. 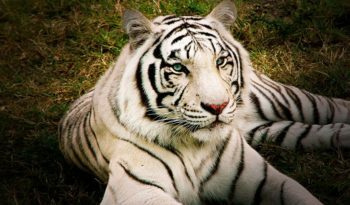 The White Bengal tiger is white with either brown or black stripes coming down the sides. The Golden Tabby is a whitish yellow colour, with amber stripes coming down the sides. Tigers have large fangs for killing and maiming prey. Bengal tigers have the longest canine teeth of any living felid measuring approximately 4 inches (100 millimetres) in large individuals. A canine tooth of a tiger is larger and longer than that of a similar-sized lion. Bengal tigers also have large, retractable claws that allow them to climb and kill prey. Their stripes help them camouflage as they stalk their prey. Bengal tigers have excellent vision and good hearing. The heaviest Bengal Tiger ever reported was 389.5 kilograms. Female Bengal tigers are considerably smaller and have an average weight of 141 kilograms (310 pounds), but they can weigh up to 180 kilograms (400 pounds). Bengal tigers are mostly solitary, however, they sometimes travel in groups of 3 or 4 individuals. Bengal tigers reside in the low-land parts of the rainforest where there are grasslands and swamps. Some male Bengal tigers occupy 200 square miles of territory and they protect it very fiercely. Bengal tigers are extremely strong animals and can drag their killed prey some 1,500 feet to hide it in bushes or long grass until it feeds upon it. The Bengal tiger is a nocturnal animal, it sleeps throughout the day and hunts at night. Despite their size, Bengal tigers can climb trees effectively, however, they are not as agile as the smaller leopard, which hides its kills from other predators in the trees. 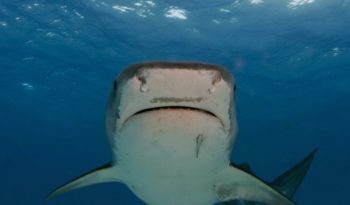 Bengal tigers are also strong and frequent swimmers, often ambushing drinking or swimming prey or chasing prey that has retreated into water. 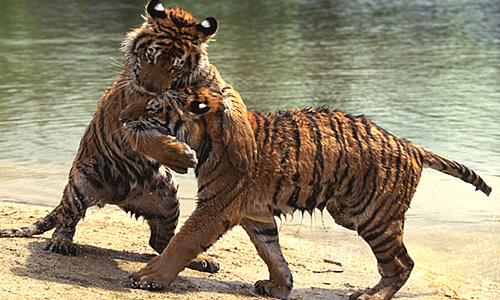 Bengal tigers also like to play and often engage in play-fighting. Bengal tigers are carnivores which means they eat meat rather than plants. Bengal tigers hunt medium-sized and large-sized animals, such as wild boar (an omnivorous mammal), sambar (a kind of deer), barasingha (a kind of deer), chital (a spotted deer), nilgai (an antelope), gaur (a large ox of South Asia) and water buffalo. Bengal tigers sometimes prey on smaller animals like hares, monkeys or peacocks and carrion (the carcass of a dead animal). Bengal tigers have also been known to prey on young Asian Elephants and rhino calves in rare cases. Bengal tigers have also been known to take other predators such as leopards, wolves, jackals, foxes, crocodiles and dholes (a species of wild dog) as prey, although these predators are not typically a part of the Bengal tigers diet. Bengal tigers kill their prey by overpowering their victim and severing the spinal cord (preferred method for smaller prey), or applying a suffocation bite of the throat for large prey. The Bengal tiger can consume up to about 30 kilograms (66 pounds) of meat at a time and then can survive up to three weeks without food. 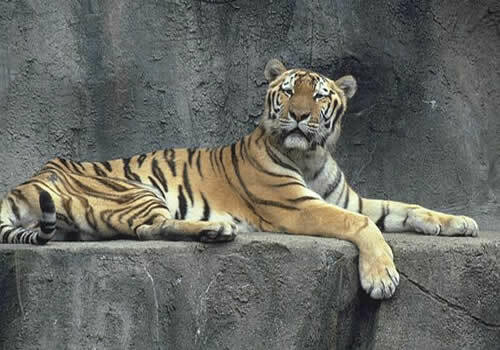 The Bengal tiger can live to about 18 years in captivity and probably a few years less in the wild. A female Bengal tiger usually has her first cubs at about 3 or 4 years old. Gestation for a female tiger usually lasts about 3 or 4 months. After this time she gives birth to an average litter of about 2 to 5 cubs. It is not unusual though to have as many as 6, or only one. Newborn cubs are blind at birth and weigh about 2 or 3 pounds. Tiger cubs are playful at birth and retain a curious nature throughout life. From the time of birth until one year, tiger cubs are also completely dependant of their mother for nutrition. 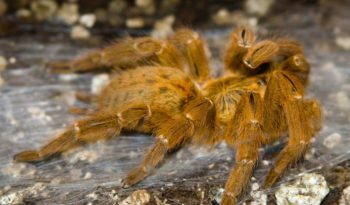 At the age of one year, they are able to kill smaller prey, but are still very vulnerable to larger predators, such as hyenas and lions. At the age of 2 years, the cubs become fully independent. Male cubs leave their birthplace and start off to find territory of their own. 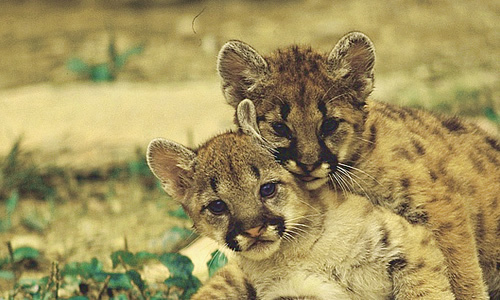 Female cubs generally stay in the same area as their mother. A cub has more stripes than an adult tiger. This helps the cubs camouflage or else they might end up as another animals dinner. Bengal tigers are an ‘endangered species’. The current population of wild Bengal tigers in the Indian subcontinent is now estimated to be around 1300 – 1500. which is less than half of the previous estimation of 3000 – 4500 tigers. Bengal tigers are in danger of extinction due to over-hunting by poachers. Habitat loss and poaching are important threats to species survival. Poachers kill tigers not only for their pelts (coats), but also for components to make various traditional East Asian medicines. Other factors contributing to their loss are urbanization and revenge killing. Revenge killing occurs as locals such as farmers who own livestock hunt down the tigers to prevent them from preying on their cattle. Poachers also kill tigers for their bones and teeth to make medicines that are alleged to provide the tigers strength.